Integrity Payment Systems’ seminar series offers easy to implement strategies. 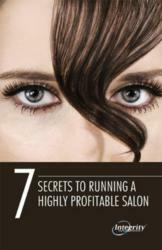 Each strategy helps business owners increase their hair salon profit margin. Seminars are located across the country to help as many businesses as possible. It is easy to loose site of the forest through the trees. Our seminar series outlines easy to implement strategies for increasing hair salon profit margins. Integrity Payment Systems (IPS) is announcing a nation wide series of seminars entitled "7 Secrets to Running a Highly Profitable Salon." These seminars are targeted towards hair salon owners and will be co-hosted with SalonCentric, the premier distribution partner to the professional salon community in the U.S.
How to increase their profit margin for guest consultations. How to coach service providers to greater success. How to automatically reduce debt while building cash reserves and wealth. How to painlessly quadruple investments in their salon. The seminars will be led by Chuck Hastings and representatives from Integrity Payment Systems, all of whom are long-time salon professionals. Salon owners who have worked with Mr. Hastings over the years consistently testify that their pre-book hair salon profit margins increase significantly, their promotions are more successful and that they see dramatic improvement in their staff coaching. To find out more information about times and locations throughout the country please connect with our press contact at 866-988-4882 or email acristerna(at)integritypaymentsystems(dot)com. Integrity Payment Systems is a merchant services provider that is national in scope processing billions of dollars' worth of payment transactions every year. Integrity is committed to customer support with one phone number for both customer service and technical support that is answered by a person rather than a machine. Their customer service personnel are in-house, and given the information and decision making authority to solve problems. Beyond customer service, Integrity Payment Systems provides a series of unique products and services not generally available from a merchant services provider. For example, they provide next business day availability of funds from credit card transactions regardless of where the merchant does their banking. Additionally, Integrity has developed automated systems that allow business owners to set aside savings on a daily basis for an emergency fund, building up a reserve for a major purchase or just saving for a vacation. With their many value-added business solutions, Integrity Payment Systems not only strives to lower the processing costs for merchants, they work to provide more benefits for the money a merchant does spend for their payments processing. Integrity Payment Systems was also the first payments processor to specialize in the salon industry. By providing savings to salon owners totaling many millions of dollars, plus their many value-added services tailored to the salon industry, Integrity Payment Systems earned the endorsement of L'Oreal USA, Redken 5th Ave NYC and many other notables within the salon industry. Integrity's salon division website can be found at http://www.IPSsalon.com. Information on other business segments can be found at http://www.integritypays.com. The company's headquarters is located minutes from Chicago's O'Hare airport in Des Plaines, IL.